Project Nepomuk is a Cross Border Cultural Cooperation project, bringing people together through Art and Music, based in the UK and the Czech Republic. Background picture of the water and lake below Green Mountain in Nepomuk. 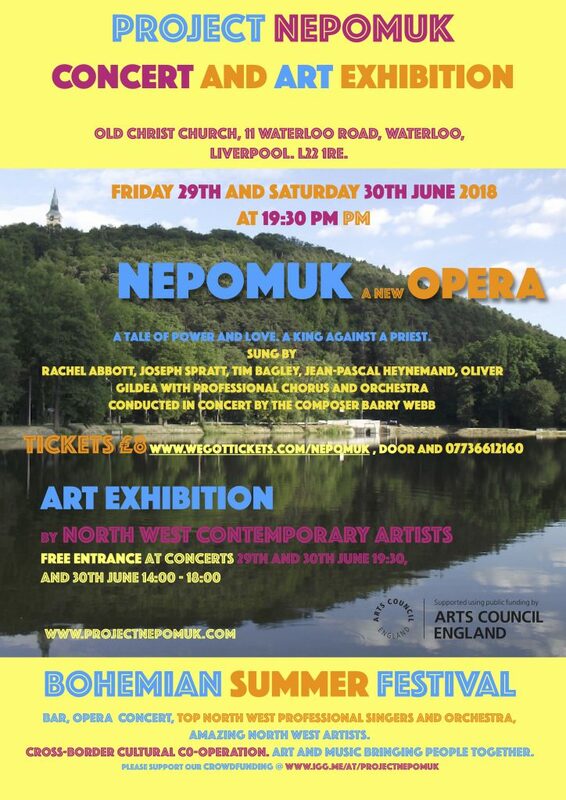 The main event of Project Nepomuk in June 2018 was a performance of a short opera in concert, the new opera Nepomuk, composed and conducted by the British composer Barry Webb. STAGE ONE. THOUGHT AND PLANNING. The following picture shows Nepomuk, and the lake and Green Mountain, from Klaster, Nepomuk. Nepomuk is the name of a town, a person, an area of land. As we speak, the town of Nepomuk has partnered with the municipality of São João Nepomuceno in Brazil. Nepomuk is a well known brand name. John of Nepomuk is also the Patron Saint for keeping secrets. Nepomuk is also the name of a half dragon, half hippopotamus, in the children`s story, Jim Knopf and Lukas the locomotive driver, by the German author Michael Ende written in 1960. Nepomuk is also an open-source soft ware network, Networked Environment for Personal, Ontology-based Management of Unified Knowledge. Various people have adopted the name, one of the more famous being Johann Nepomuk Hummel, a 19th-century Austrian composer and virtuoso pianist. Nepomuk os a town 30 kilometers south od Plzen, in the Czech Republic. The name Nepomuk has taken on many meanings, and has been used to mean different things. John was born in Nepomuk in 1340. 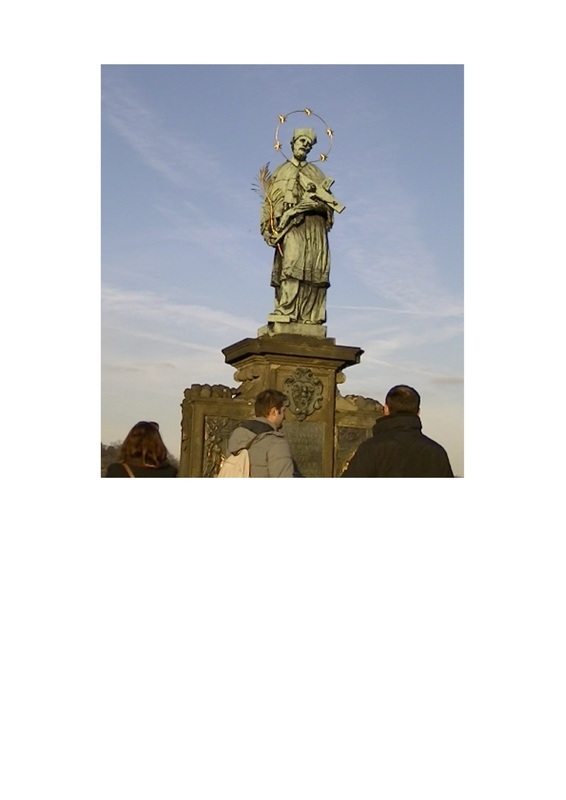 See the picture on this page, of the baroque statue of John of Nepomuk on Charles Bridge, Prague, where he was thrown into the water of the Vltava river to drown in 1393. John is the patron saint against floods and his statue can be found on bridges throughout the world. Water is a symbol of life . Project Nepomuk completed school workshops on the theme of water, using bits from the opera and other music, and the children produving their own pictures, to be displayed at the Art festival. These thoughts are discussed in the new opera Nepomuk. This new opera will be a central part of the cross border cultural project. Water and positive growth are contrasted with addiction to power and money. Water for Project Nepomuk is a symbol of growth. Water connects countries, and continents. Liverpool is an international port. 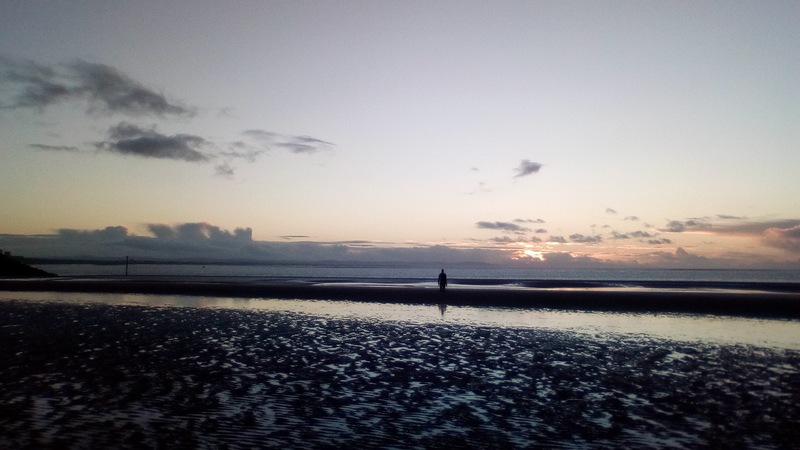 When standing on the beach at Crosby, ships arrive from around the globe. Anthony Gormley`s sculptured figures ‘Another Place‘ look out boldly to the estuary from the beach ( see the picture here). The 100 cast-iron, life-size figures spread out along three kilometres of the foreshore, stretching almost one kilometre out to sea. Liverpool connects to the World as a city of Art and Music. Liverpool is an Unesco City of Music. Water flows in the seas past Continents and by rivers through other lands, finally reaching the land locked Czech Republic, an outstanding place of beauty and culture, full of Unesco sites. Project Nepomuk is entirely non political and non religious and stands for cross border cultural cooperation and understanding through the media of Art and Music. Project Nepomuk is not bound to the city of Nepomuk, but aims to work in many places.